The Call for WSO-UV Core Program Proposals requiring preparatory observations, that was opened on 8-October-2018, has been closed on 11-January-2019. See further details in the JCUVA WSO-UV site. The World Space Observatory – Ultraviolet (WSO-UV) is part of ROSCOSMOS scientific program and has been developed in collaboration with Spain. WSO-UV is the third mission of the Spektr (spectrum) series of the Russian Federal Space Program after Spektr-R (in orbit since 2011) and Spectr-RG (with Russian ART- and e-Rosita payloads). All missions of the Spektr series use the NAVIGATOR platform. 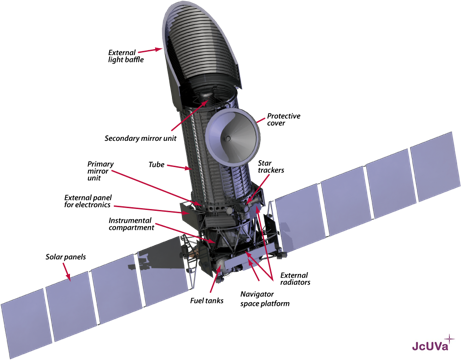 The scientific payload consists of a 170cm primary space telescope, equipped with instrumentation for imaging and ultraviolet spectroscopy in the 115 to 315nm range, from Lyman-alpha to the atmospheric cut-off. The WSO-UV will be placed in geosynchronous orbit in 2023 by a Proton launcher becoming the first 2-m class ultraviolet observatory flown into High Earth Orbit (HEO). The mission is run by an international consortium led by Russia and also involving Spain. This is the web page of the Spanish team. Visit here the Russian site. The WSO-UV premises at the Universidad Complutense of Madrid are provided by the Joint Center for Ultraviolet Astronomy (JCUVA). The Spanish participation is funded by the Ministry of Industry, Energy and Tourism (industrial activities) and the Ministry of Economy and Competitiveness (scientific activities). The Universidad Complutense de Madrid (UCM)is the scientific responsible for Spain.